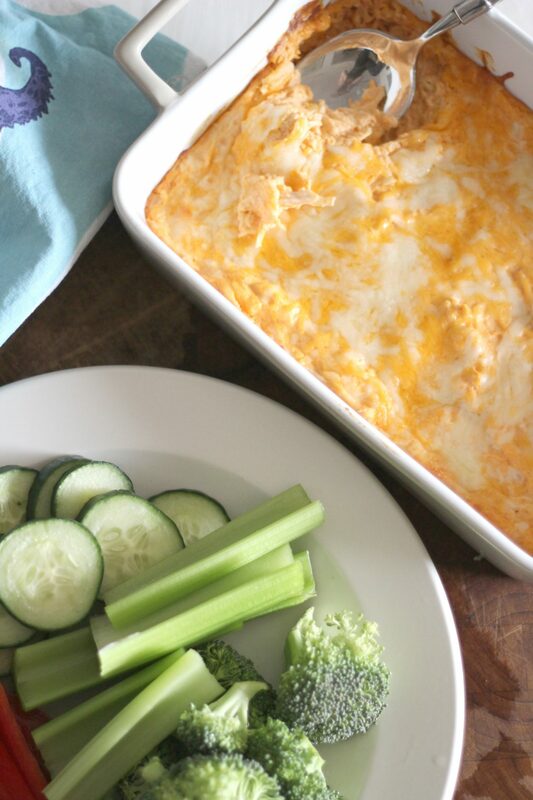 Quick and Easy Low Carb Buffalo Chicken Dip. This is the perfect recipe for a game day or any day type of snack. 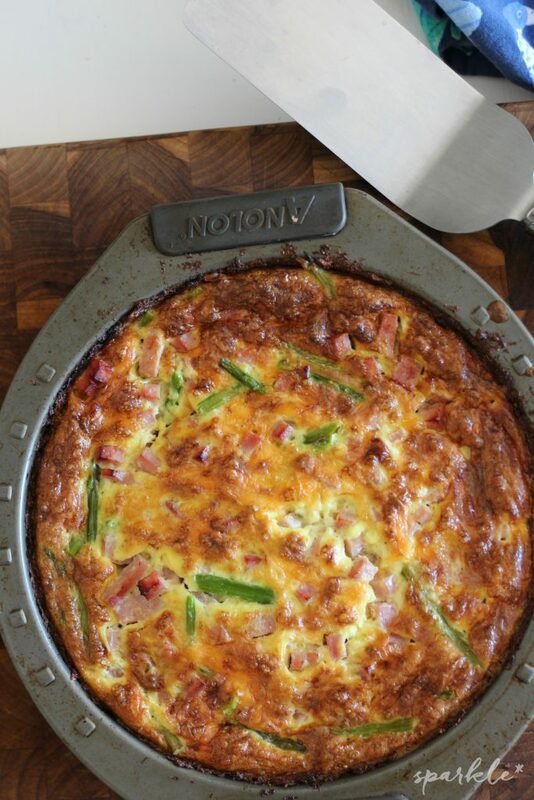 It is so flavorful and is perfect with vegetables! For anyone that follows a certain eating plan, potlucks can be trials of willpower. The other night I was at work and it was the last shift of a beloved co-worker. I hadn’t been at work for a week or so, so was unaware that this was being planned and didn’t bring anything to share. No big deal though. When I finally get my lunch break at around 1 am, I perused all the delicious looking food. Taquitos and mini tacos from a local Mexican food joint, platters of cookies, a fruit, lots of chips and salsa, a giant cake. Yep, they all looked great and they all looked full of carbs. 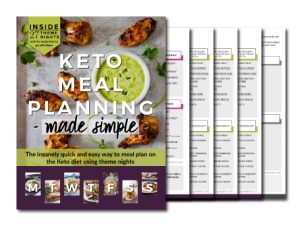 At this point I was three weeks into my ketogenic diet and wasn’t ready for a cheat day. At that point I kind of resigned myself to an extra cup of black coffee and some questionable vegetables from a store-bought veggie tray for lunch. But then I spied a lonesome mini-slow cooker on the counter. What could it be? I thought to myself. 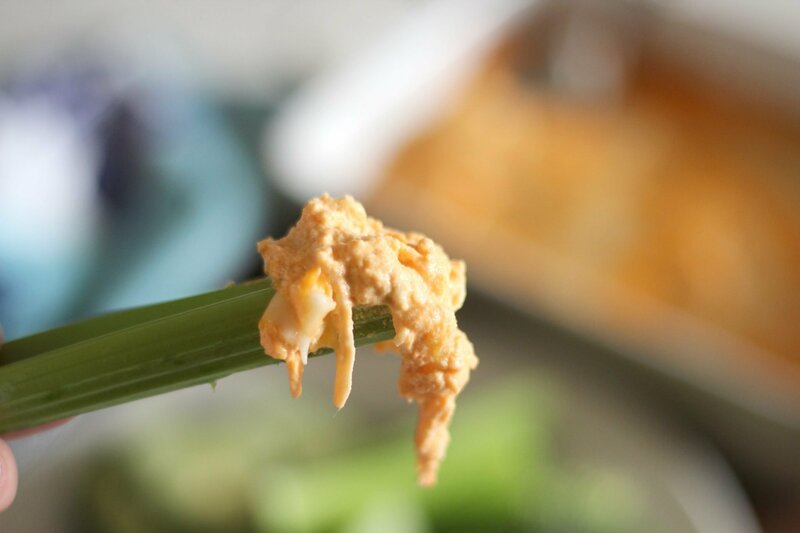 And there it was, my late-night lunch, buffalo chicken dip. 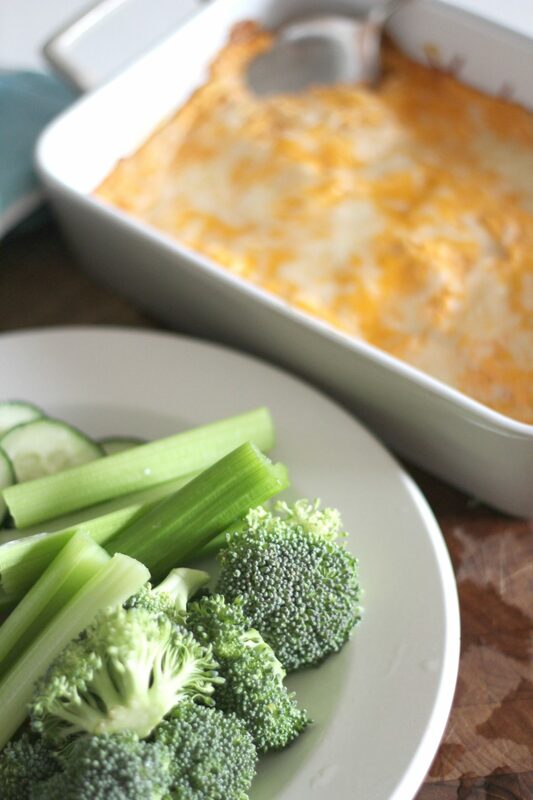 All the sudden that limp broccoli didn’t look so terrible, because it was about to become a vessel to get that hot-gooey dip into my mouth. And that kids, that is the story on how I fell in love with a melty combination of hot sauce, cheese and chicken. This recipe can be easily tweaked with just a change in the type of hot sauce you use. This last time, I used Frank’s Hot Sauce, which has a nice amount of heat, but isn’t overpowering at all. One time I used Moore’s Buffalo Wing Sauce, which had great flavor, and was pretty mild. I want to try it with garlic, habanero or jalapeno hot sauce. Just be sure to watch the carbohydrate count on the sauces, you never know where you’ll find hidden sugar! I prefer to beat the softened cream cheese and sour cream together with a hand mixer to prevent any cream cheese lumps. You could get away without doing this, but be prepared for bites of cream cheese! Beat in the hot sauce and the garlic and onion powders. Add an extra dash of hot sauce and freshly ground black pepper if you’d like. Meal prepping the shredded chicken ahead of time makes lunch and dinner easy. You’re all set to stir in the chicken and the cheeses. I’ll be perfectly honest in that I bought packaged grated mozzarella for this. I absolutely despise grating my own mozzarella, since the cheese is typically softer and I always grate a finger. Maybe this cheese grater would save my knuckles! But I love my Tillamook cheese and grate my own cheddar. 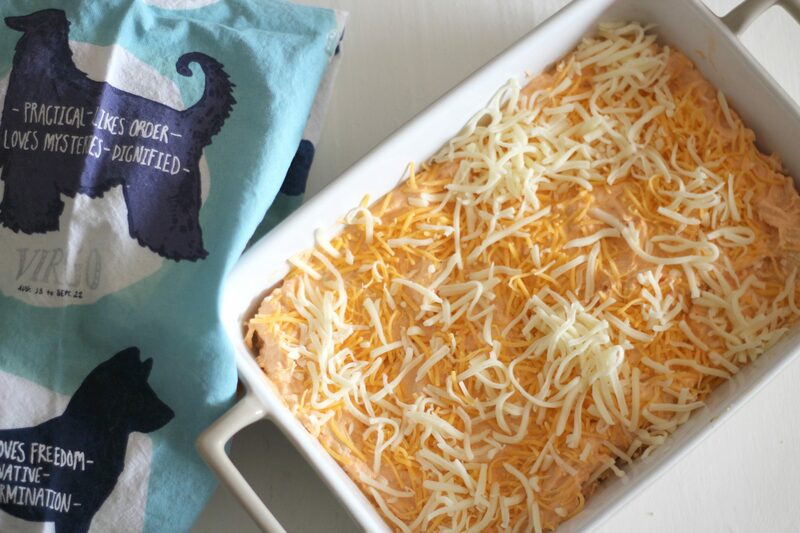 Now you can spread buffalo chicken dip across a small baking dish, and top with more cheese. Bake at 350F for 25 minutes, until the dip appears hot and bubbly and your cheese is melted. 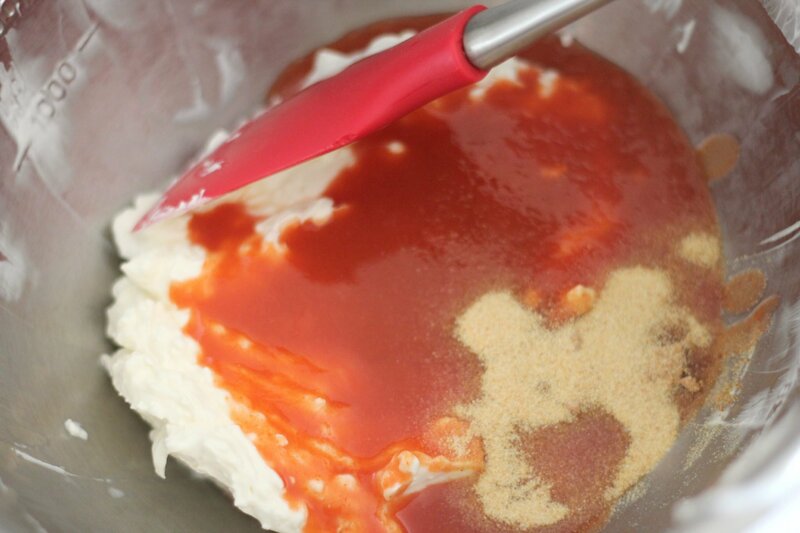 Beat cream cheese and sour cream with a hand mixer until smooth. Then add in hot sauce, black pepper and garlic and onion powders. Mix well. 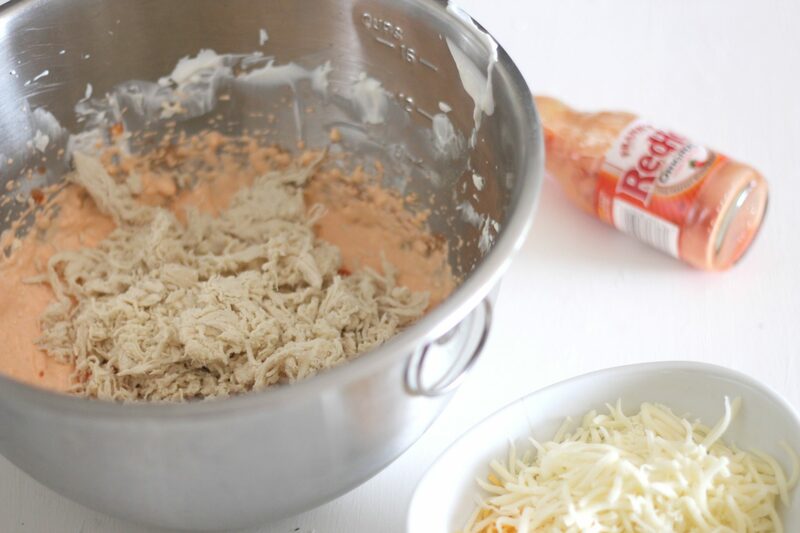 Stir in shredded chicken and 1/2 cup mozzarella cheese and 1/2 cup cheddar cheese (reserving the rest for the topping.) Stir ingredients together and spread across a 5 x 8 (or similar sized) baking dish. Top with remaining cheeses. Bake for 25 minutes until bubbly and cheese is melted. Serve warm. 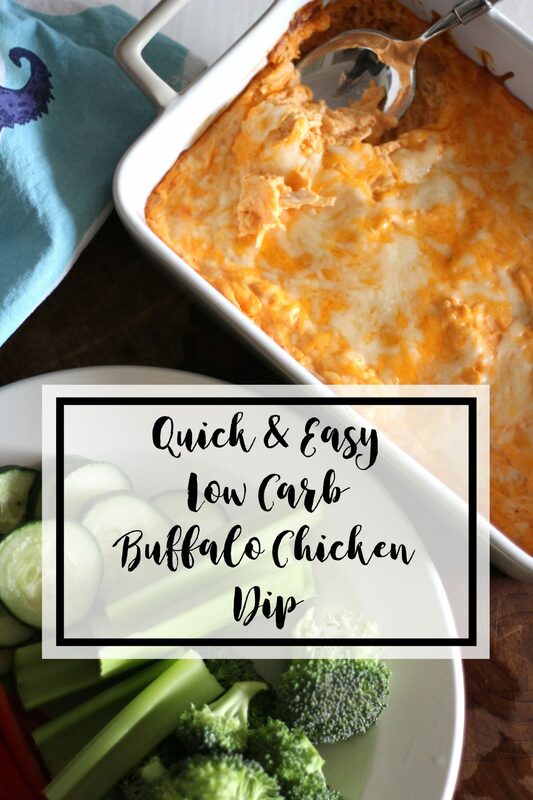 This low carb buffalo chicken dip is a great low carb snack and goes perfect with cauliflower, broccoli or celery. Yum!